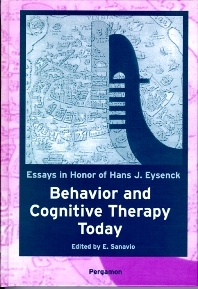 This book carries the Proceedings of the European Association for Behavioural and Cognitive Therapy conference held in Venice in September 1997 and is dedicated to the memory of Hans Eysenck. The EACBT conference provides a rare opportunity for a wide range of clinicians and researchers from all over Europe and the USSR to come together, resulting in a highly topical and valuable range of scientific presentations. The Proceedings comprises over twenty papers addressing key subjects in terms of behavioural and cognitive therapy including panic, affective disorders, paraphilia, schizophrenia, PTSD, obsession and other psychological disorders. Of particular interest are chapters on the use of cognitive behaviour therapy versus supportive therapy in social phobia (Cottraux), the psychological treatment of paraphilias (De Silva), the theory and treatment of PTSD (Foa), the use of Diagnostic Profiling System in treatment planning (Freeman) and a cognitive theory of obsession (Rachman). For clinical psychologists and psychiatrists. Foreword. Exercise of agency in personal and social change (A. Bandura). Cognitive-behavioral case formulation (M.H. Bruch). An approach to the treatment of paraphilias (P. De Silva). Treatment selection in cognitive and behavior therapy (P.M.G. Emmelkamp). Supervised cognitive-behavior therapy for insomnia in general medical practice—preliminary results from the West of Scotland Program (C.A. Espie et al.). Cognitive-behavioural strategies for the treatment of schizophrenic disorders (I.R.H. Falloon et al.). Post-traumatic stress disorder in female victims of assault: theory and treatment (E.B. Foa, L.A. Zoellner). Cognitive behavioral treatment of personality disorders (A. Freeman, J.T. Jackson). Applications of cognitive models of OCD to clinical practice (M.H. Freeston et al.). Process of change in exposure therapy of phobias (K.G. Götestam, B. Götestam). The clinical implications of a psychological model of paranoia (P. Kinderman, R.P. Bentall). Self-directed experience and personal therapy: the situation in the German-speaking countries and the "state-of-the-art" of empirical research (A.-R. Laireiter). Cognitive aspects of post-traumatic stress disorder (R.J. McNally). A behavior analyst in the land of behavior therapy, or the evolution of behavior science (P. Moderato). Anger predictors of the assaultiveness of forensic hospital patients (R.W. Novaco, S. J. Renwick). A cognitive theory of obsessions (S. Rachman). A new psychotherapeutic strategy: well-being therapy (C. Rafanelli et al.). Topography of the first interview (E. Sanavio). Disorder-specificity of attentional dysregulation in anxiety (G. Sartory). Prevention and management of behavior problems: the TEACCH approach (E. Schopler). Assessment of young people and HIV pandemia: results from an original Italian questionnaire (C. Sica et al.). In vivo exposure for panic disorder and agoraphobia: does a cognitive rationale enhance treatment efficacy? (I. Sochting et al.). Cost-effective behavior therapy for obsessive-compulsive disorder (G. Steketee). Inferiority in social phobics, obsessive-compulsive, and non-clinical controls. A controlled study with the inferiority scale (Sai-Nan Yao et al.). Author index. Subject index.